Hypnotically beautiful and, our glow/light shows we use ultra violet (UV) and high intensity LED lights to produce the most spectacular technological display of light and energy. This is to create a show for any event where the use of fire is inappropriate, due to the restrictions. Fire acts are not legally permitted to perform within any Class A buildings, due to obvious safety concerns. These shows are perfect for indoor functions. As with all our shows we include the audience and share our enthusiasm and energy with them. Our glow shows incorporate dance, UV and glow staffs, glow poi, and a very outrageous performance using the rarely seen “Boomerang Bungee staff” as well as other visual treats. UV, light and glow shows are spectacularly colourful and hypnotically beautiful. For best effects, this is usually performed in a dark environment. Illumine is a 7 minute high impact glow show which has been a huge success all over the world. Two artists, a fully choreographed show, with fantastic acro-balance inspired stunts and packed with hypnotic visuals to an exciting contemporary sound track. With new digital LED technology that allows them to program full colour (16 million colour to be exact) images, letters, words and logos. This allows the client to include their name, company name or logo into the finale section of the show. 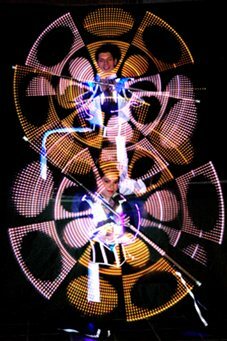 Illumine is also available as a 10 minute, three and four artist show for larger scaled events which include LED hula-hooping and juggling routines. 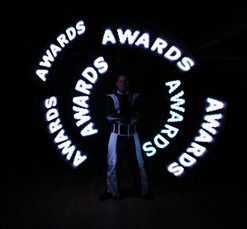 Illumine uses versatile, eye catching LED light costumes that have already proven to be a winner from corporate events, private parties to product launches. The first in the world to use digital pixel staff technology in light shows, which allows them to create images twice the size of any technology that already exists, they also use digital poi in the show for extra effects. The images, colours and sequences are pre-programmed before the show on a PC and then uploaded wirelessly to the equipments’ on board memory. All the images are controlled to the millisecond, seamlessly choreographing the lights of the equipment with the music and artist. Johnny & Helen offer 7 min or 10 min digital logo glow shows. Johnny and Helen have recently created “Olympic Illumine” a high impact digitally programmed light show just in time for the Olympics. Performed by two artists, a fully choreographed show, with fantastic acro-balance inspired stunts and packed with hypnotic visuals to an exciting contemporary sound track. 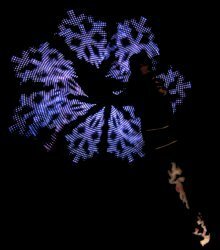 Olympic Illumine uses versatile, eye catching LED light costumes that have already proven to be a winner from corporate events, private parties to product launches. The first in the world to use Digital Programmed Staff Technology in their light shows, which allows them to create images twice the size of any technology that already exists. They also use Digital Poi in the show for extra effects. The images, colours and sequences are pre-programmed before the show on a PC and then uploaded wirelessly to the equipment on board memory. All the images are controlled to the millisecond, seamlessly choreographing the lights of the equipment with the music and artist. Please contact us about any information you may require about custom programming for your event. If you require a specific colour or theme they are able to programme the images accordingly. If you require a freestyle glow artist we have performers that can ‘Meet and Greet’ instead of having a formal stage show. 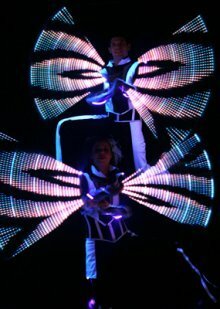 The Olympic Illumine show is 7 minutes, but is also available as a 10 minute, three and four artist show for larger scaled events which include LED Hula-Hooping and juggling routines. We had great feedback regarding the entertainers on Saturday. The LED performers were fantastic and I think everyone recognised how unique they were. Think the Digital Glow Show was fantastic and captured the audience. Had a quick look around the room while they were performing and everyone seemed mesmerised. Incorporating the Energizer Logo was a great touch and looked brilliant – definitely one to keep for something in the future.